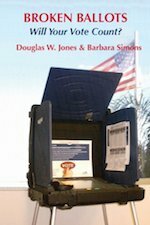 This valuable work starts with a history of use of technology in elections — of special interest to the technologist — and continues with many chapters on our recent electronic voting history as it relates to election integrity issues – made the richer because the authors were often participants as events unfolded. The Verified Voting organization has two components: VerifiedVoting.org, a 501(c)(4) nonprofit lobbying organization and The Verified Voting Foundation, a 501(c)(3) nonprofit educational organization. You may access both from VerifiedVoting.org. “Verified Voting’s mission is “Safeguarding elections in the digital age.” We are a non-governmental organization working toward accuracy, integrity and verifiability of elections…The Verified Voting Foundation, Inc. is an educational nonprofit 501(c)(3) corporation. “Black Box Voting, founded in 2004, is a nonpartisan, nonprofit investigative reporting and public education organization for elections. “Influential reporting by Black Box Voting is referenced worldwide. We became known for our groundbreaking work on electronic voting machines, which can remove transparency of the vote count; our other important work pertains to voter lists, election chain of custody, transparency problems with absentee voting, election industry corporate governance, and financial accountability in elections. The Election Quality News is a website that monitors election quality “from Colorado and beyond.” An excellent springboard for investigating issues of election quality and integrity, especially at the local and regional level. The Voting News, which is a news service of the Verified Voting Foundation, lists various sources of voting-related news, and includes a weekly newsletter, national and international voting-related news, editorials, and blogs. The Brad Blog, written by Brad Friedman, is independent of corporate or foundation funds, and often has original news stories on election integrity or lack thereof, as well as other topics. “The BRAD BLOG is a 100% independent investigative news, journalism, blogging, muckraking and trouble-making outlet, now in our tenth year! Charles E. Corry is an accomplished scientist who, eschewing the pedantic, writes about the serious problems with electronics in voting and voting registration; and with mail ballots. He has served on the Voting Equipment Standards Committee of the Institute of Electrical and Electronic Engineers since 2001.